I need some help. I purchased a Skillard s30 splitter for type 1 air dam and can't seem to install it. Here's my combo: 73 240z MSA urethane air dam - http://www.thezstore.com/page/TZS/PROD/classic02a01b/50-1411 Skilard Splitter - https://skillard.com/products/240z-260z-280z-front-lip-splitter the problem? The bolts that should go into the core support aren't the right size The sway bar is in the way The biggest problem, the splitter wont even mount up flush onto the core support, its off by many inches The air dam appears to be way lower that those of the pictures I've seen, so when i pull up the splutter to the bottom of the air dam, it doesn't come up to the core support to allow it to mount up. One thing I know will get in my way - the previous owner hacked in some radiator supports that are lower than the stock core support - so I'll have to make some adjustment there. Does anyone have pictures of the core support and the mounting holes I should be using? Does this air dam even work with the splitter? 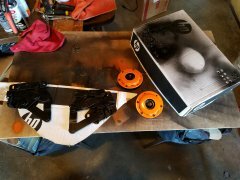 Did i completely F it up by buying two incompatible parts? I'll try and take some pictures but without more hands it'll be hard to show the gap... Helps!!! As you all can undoubtedly tell I'm new to the forum and decided that I might as well document my build for my own purpose of keeping track of things and organizing my plans and thoughts. This is the first time I've created a build thread for any of my projects so bare with me and don't pile the BS up to high, I'm kinda short and I don't swim to well in the green stinky stuff. I've always loved the look of Zs and I have wanted one for quite sometime. The opportunity has presented itself recently for me to get one from a co-worker who has decided to part with an extra "parts" car that he has a few miles from my house. I checked the VIN tag and it appears to be a '75 280z. The engine and manual trans are in unknown condition and the body is in desperate need of paint and some rust repair, but what neglected S30 doesn't need all of those areas fixed. All of that a side the cost of the car is pulling the LH door for him to install on his '70 240z or find an acceptable replacement for his current door and the car is mine. A couple of days after being told that I can have the car a local classifieds had a fairly complete VK56DE out of a 2005 Armada for free with a spun #4 rod bearing and otherwise pristine internals. The seller included a fairly complete engine wiring harness, injectors, fuel rails, intake, block, heads, internals and oil pan as well (some items are already removed and on the shelf). I've always liked the raspy growl of ITB injections setups but can't stomach the price tag on my salary, but while looking around at a few other VK56 builds on other forums I decided that if I'm going to go thru the all of the fabrication headaches of stuffing the beast in I might as well go big or go home. So I researched some different options using extrudabody, gsxr throttle bodies and a few other motorcycles until I came across some really inexpensive BMW units on ebay. I paid $2 and shipping for 4 throttle bodies in a bulk buy and they arrived last friday, and another one is on it's way with the injector and TPS for under $20. I'm on the look out for some good deals on the remaining three units. These ones have a stock 336cc/min injector vs the vk56 286cc/min from what I've been able to find online, they also have a straight thru 45mm ID and the injector will clip right into the factory VK fuel rail. I haven't decided if I'm going to use the BMW injectors for sure yet, I'm thinking initially I will just install the VK units with a small press fit bushing to reduce the bottom sealing boss to 14mm from 16mm. I already ordered some replacement shaft bushing as they are a known problem for the BMW oilheads and talked to a few friends about linkage and shaft design. I think I can get an 8mm precision stainless shaft to run thru all 4 on each side and then put a cam arm on each bank with a solid link to a torque arm and cable pulley in the center done failry easily. Once I finish getting the adapter plates for the head to throttle body modeled in solid works I'll be able to get a better idea of the specifics. The spun rod and crank need to be addressed first though, but I've got some mad scientist ideas for that in the back of my head too, we'll see what the engine shop machinist has to say first... As far as drivetrain goes I'm still researching and trying to decide what transmission option will be the best in regards to price, ease of conversion, longevity and power handling capabilities. The top two choices currently are a Z32 manual or a CD0009. Differential will initially stay the stock open R200 until I get the bugs of the engine and trans swap all worked out and then as funds and the necessity for stronger parts come into play either an R230 swap of some form or the Ultimat IRS 8.8 that wfritts911 has worked out in the drivetrain section. Just clarify for those still reading this I am well aware of how difficult and intense this swap will be and that many people all over the web have started, talked about and never completed the swap but there are some who have paved the way in S130s, buggies, 240sx, 350s and 370s. All of that being said this will be a pretty drawn out and long process as I don't have a set pool of money to just throw at a project until completed. I've got 4 kids and I'm the bread winner for our family working 1 full-time and 2 part time jobs. I do how ever have some very good connections with a few local machine shops, mechanical engineers, fabricators and professional welders. I also work full time at a government shop where I can use any of the tooling and facilities after hours that I don't have at home as long as I clean up after myself. That's about all I can stand to write for now, as things progress I'll try to take lots of pictures and document as much as possible. 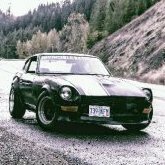 6l80e fit in a 75 280z? I finished my LS1 and 4l60e swap this spring into my s30. Have enjoyed driving it this year. My plan this winter was to pull the motor and trans and rebuild them. Both are bone stock. Motor is going to be completely rebuilt with c/h/i. While trans is getting built up to handle more power and fix failing clutches. That was until my friend at the junkyard called and said he has a ls3/6l80e with harness and pedal out of a 2013 Camaro ss with 50k miles. I can get it for about $4300. I know the ls3 is no issue, but I can’t find anyone who has put a 6l80e. How much bigger is it than a 4l80e? My LS1 has about 180k miles on it and by the time I rebuild both it and trans with a higher stall, I figure I will have about what the ls3 pull would cost me. My Z was originally an automatic, as was the donor z28 Camaro I took the original drivetrain from. I guess I could always convert to manual and run a t56. Is a 6l80e something I can message in, or is it a major surgery not worth messing with. Getting the hood ready for some paint. 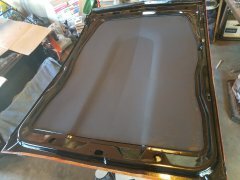 The under side of the hood painted flat black in the center and gloss on the edges. 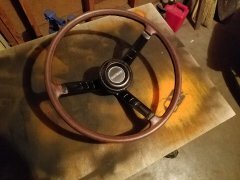 Tried to clean up the steering wheel. After putting everything back on it's looking much better. I really need to take care of that signal light though. Don't have the time to do the welding myself anymore - what shops in Houston do you recommend? Hey guys, I don't really have a garage anymore due to Harvey and we are actually leaving the city for the Pacific NW coast sometime next year so I'm kind of in a bind. 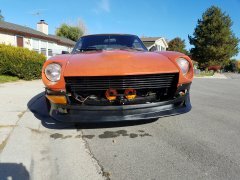 I have a '72 240z with some extensive rust. I can't really attempt to do this myself as a project any longer and I thought about selling her and buying another after I move, but I don't want to lose this car and try and find another which will probably be in a similar state anyway. 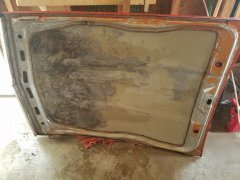 Is there a shop in Houston that you recommend for the rust repair? I've been in contact with Awesome Z (Doug) and HoustonZAuto. Is there anyone else I should consider leaving my car with for the repair? Thanks in advance!